You'll surely enjoy yourself at this beautiful, free-standing villa with its own private pool. Whether it's from your living room or from your lounging chair on the partially covered terrace, you'll be taking in a gorgeous view of the valley, with the sparkling sea in the distance. Choose peace, quiet, and privacy! That is, unless you've been challenged to a game of billiard, table tennis, or foosball! 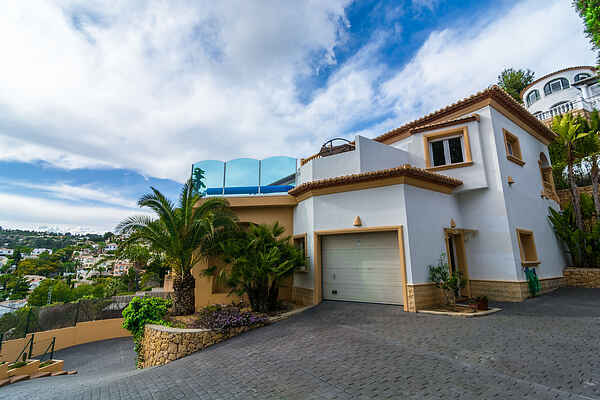 This holiday villa is located in Montemar/Benissa, very close to the cozy town of Moraira (4 km) and its automobile-free streets. The Friday marketplace in the center of town is an especially large tourist attraction. In Moraira, you'll also find the beautiful, sandy beach of l'Ampolla, lined with lounge chairs and a seaside tent for a refreshing drink or tasty lunch. For sports lovers there is a variety of 9-hole and 18-hole golf courses in the area. The closest is the Ifach course (4 km), with its stunning surroundings and masterful landscaping.